On the specifications front, the Hot S3 comes with 5.65 inch HD+ Full view display with an aspect ratio of 18:9 having resolution of 720×1440 pixels with 2.5D curved glass. This phone is powered by Snapdragon 430 octa-core processor clocked at 1.4GHz mated with Adreno 505GPU. It has options of 3GB/4GB RAM and 32GB/64GB of internal storage which can be expanded upto 128GB via dedicated microSD card slot. This phone has two slots for Nano SIM cards and one separate slot for microSD card. This phone is packed with powerful 4000mAh battery. On the photographic front, this phone is mounted with 20MP front camera with f/2.0 aperture, Dual LED flash, 5P lens, Sony IMX 376 sensor and Bokeh effect feature. It is equipped with 13MP rear camera with PDAF, f/2.0 aperture, 1.12um 5P Lens and Dual LED flash. This phone runs on XOS 3.0 based on Android Oreo. For connectivity, this phone offers options of 4G VoLTE and ViLTI, Bluetooth 4.2, OTG, Wi-Fi 802.11 b/g/n, GPS. 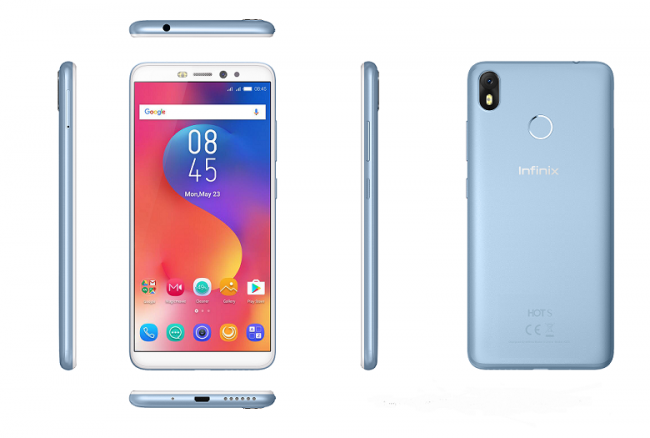 It also comes with Fingerprint sensor on the back which besides unlocking the phone, can also perform functions such as capturing images, accepting calls and recording the calls. It also has Face unlock feature.